I’ve been saying it for years; Google does what’s good for Google. They’ve made a lot of changes to their site and results over the years that look like good user-focused improvements, but what is really going on is that Google wants to be your ANSWER engine, not your search engine. They don’t want you to go to other websites, they want you to stay on theirs and click on things that make them money. I’ve reported on Google’s shenanigans over the years and how they have made ads less obvious, how they answer queries right in Chrome’s search bar, how they’ve stolen content to give a “How-To”, and how they’ve changed the amount of space taken up by links that make them money multiple times. Those are just a few of the things they’ve done to make sure you stick to their site and don’t visit any others. Google scrapes content, yet they specifically ban sites for doing it. They also make their pages top-heavy with paid ads, but then specifically depreciate the ranking of sites that mimic their behavior, etc., etc. Webster’s Dictionary needs to change the definition of “hypocrite” to just say “see: Google”. They’re at it again but this time it’s a bit more worrying because they’re going beyond just scraping content; they are actually providing an app from the search results. Appmakers beware: Google’s coming. 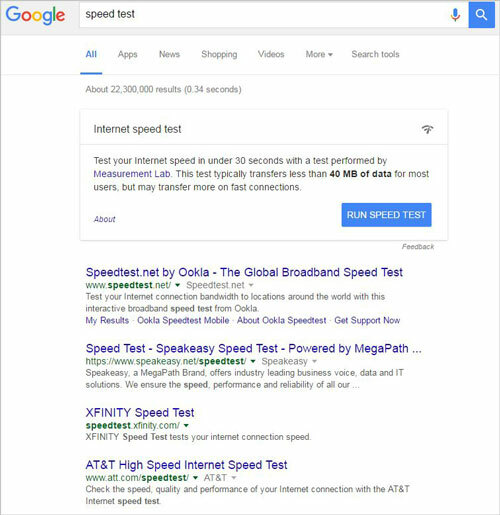 I saw it when I searched “speed test” and was presented with the image below (apparently they’ve been testing it since late June but this is the first we’ve seen of it). Clicking on “run speed test” pops up a little window that actually runs a speed test right there. Yes, it’s a good test, and yes it gets the user what they want faster… but it has to be absolutely killing speedtest.net. Can you imagine the panic in the office when they first saw this in testing? Can you imagine how disheartening it is to helplessly watch your traffic evaporate? What could they possibly do? It doesn’t matter how good their service is, if people can get it right from the results you can bet they won’t be visiting speedtest.net. I certainly didn’t. Sorry guys, you’ve been Googled.